The latest MSX/ZX release from Spanish coders Relevo Videogames has already received it's fair share of press coverage. Being (quite possibly) the only retro-platform videogame coded as a promotional tool for a drinking establishment - and originally only available to play (and buy) in the Azzurro Rock Pub in Bilbao, Spain - it's easy to see why Azzurro 8-Bit Jam atracted so much attention upon it's launch. Several weeks later, the excitement surrounding the game has calmed and the MSX and ZX Spectrum ROM/TZX files have finally been made available for free download from the Relevo Videogames site. So, was it worth the wait? Does it live up to the hype? Azzurro 8-Bit Jam is essentially a casual-style arcade/action puzzle game based on that finest of sports - quaffing ridiculous quantities of different liquor shots as quickly as possible, just like we used to in England at 10.55PM back in the days before 24 hour drinking became the norm. 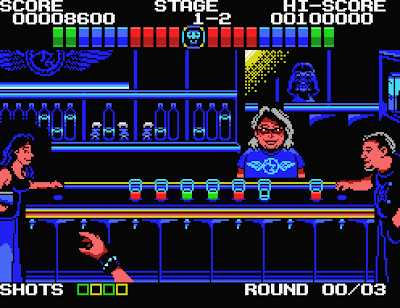 Not completely unlike Tengen's Klax in game-play, but an original concept nonetheless, your goal is to keep up with the hyperactive barman (modelled on Azzurro's real-life bar-steward Sergio Itxaso) and drink the different coloured intoxicants in the correct order without the bar becoming full of glasses. Played from the first person perspective, you control a pair of arms at the bottom of the screen with which you can grab drinks and either knock them back, return them to the bar or pass them on to the other patrons sat at either side of the game screen. 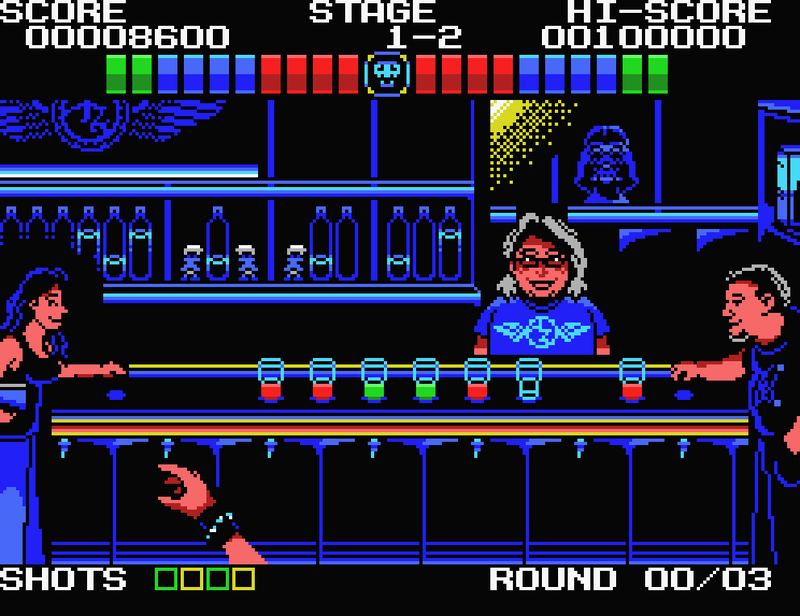 (One of the nicest features of Azzurro 8-Bit Jam is that all the characters are based on the bar's staff and regulars. It must have been a blast to play this in the venue on launch night with all the game 'heroes' in the flesh). Throughout the game, Sergio will do his best to fill the bar up with shots as quickly as he can, pausing every now and then to distract you by wearing masks or unhelpfully filling spaces with unmoveable empties. Guzzle down the hard stuff in the wrong order and your arms spasm in pain as you lose valuable time (and braincells, no doubt) and you'll have to start the combination again. Lose the game entirely and he'll laugh merrily as you're (quite possibly) vomiting all over yourself off-screen, pockets empty. Win, and it's on to the next challenge. So how do the MSX and ZX versions compare? Both feature a near identical soundtrack of chip-tune tributes to a number of familiar rock anthems, but obviously the visuals of the MSX are much nicer than the ZX, and for that reason alone it's understandable why the MSX version is the one used for the actual 'arcade machine' installed in the bar. However, I personally found the MSX's two-button control method far less intuitive than the Spectrum's up-to-pick-up-and-fire-to-drink approach, so that's the one I'd personally recommend. In conclusion, Relevo Videogames have crafted a brilliant and original game worthy of it's arcade setting (albeit only in one venue). Sure, the gameplay might get a little repetitive after a while and the Spanish intermission text screens should really be translated to English for the wider audience, but regardless, Azzurro 8-Bit Jam is both very enjoyable to play, quirky in concept and addictive enough to draw you back time and time again to beat your previous score. But remember kids - don't try this at home unless you want to spend a night down at A&E having your stomach pumped... (ah, the memories). Download the game here (from the Relevo Videogames website). lol love it! its fantastic people are still around who can code this kind of thing out of those machines. wish I was one of them, such an interesting hobby! miss my old spectrum!